Emma’s designs fuse cute retro regalia she's nostalgic for with a contemporary aesthetic. 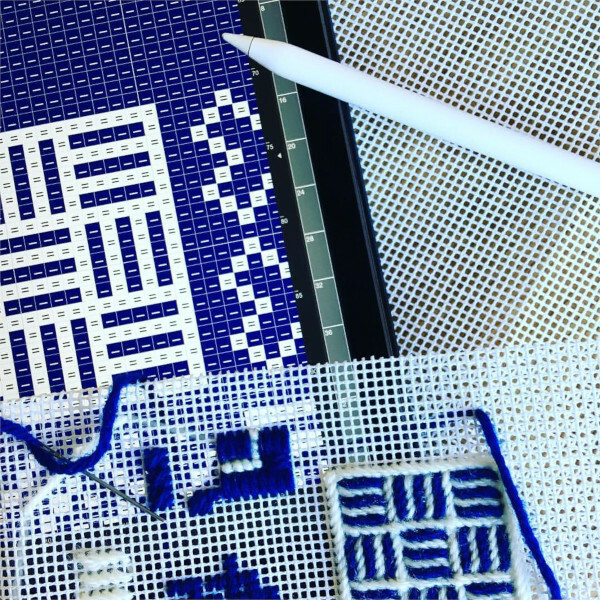 So far this has resulted in modern yet ephemeral designs that provide a way for us to enjoy our own memories and explore the relationship we have with the objects she's chosen to honour in needlepoint. 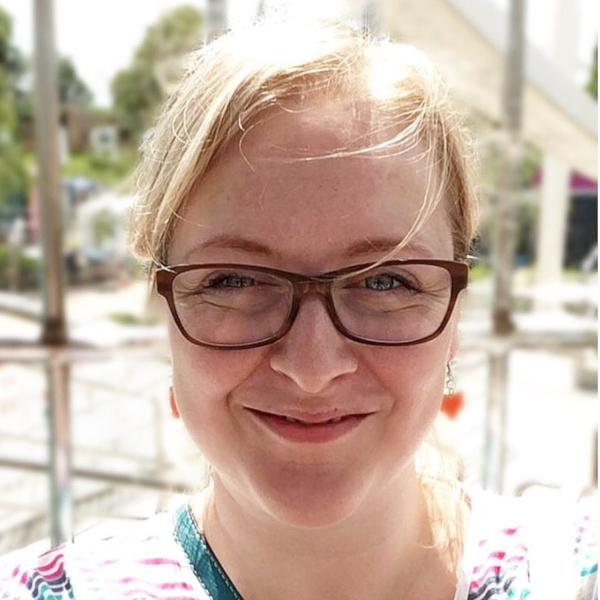 Emma talks to us about the challenges she's faced as a fledgling designer, top tips for beginners and how she works with licensed artwork. Let's cut the cake, mine's a Lemon Drizzle, and pour a cuppa as we get to know more about her. Hello Emma, can you tell us a little bit about yourself? 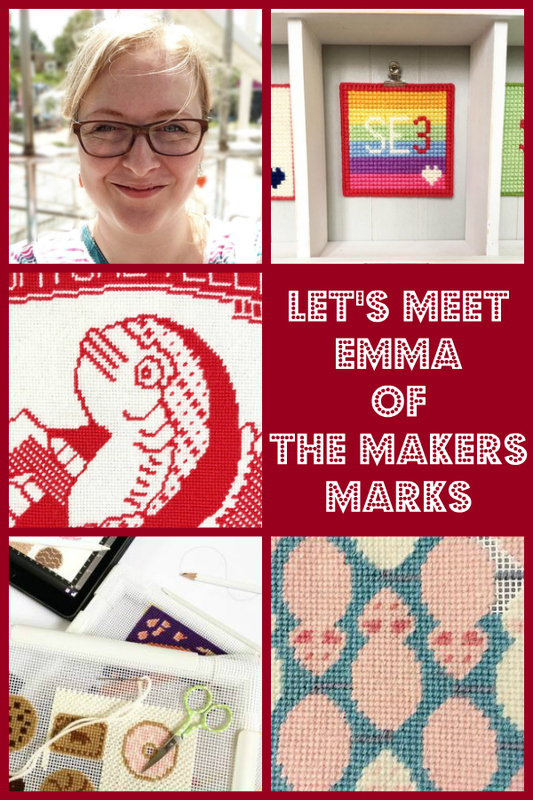 I’m Emma Taylor aka The Makers Marks. I used to be a Photography Agent and decided to set up my own Creative Consultancy in the photography and advertising sector 8yrs ago. By night I’m building my craft empire (hopefully). Just to make sure I’m super busy, I’m also the VP of my local WI and volunteer at SELWAT (South East London Wool and Textile Society). I live in SE London with my awesome husband, Martin. 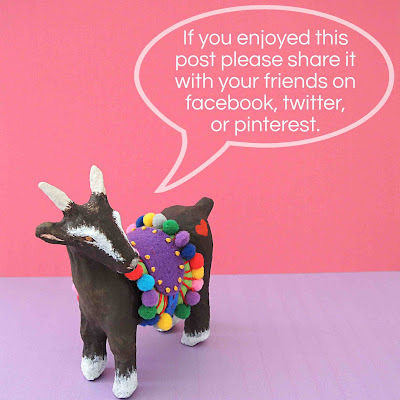 Can you share a little bit about your passion for needlepoint? My mum is super crafty so I was always going to pick it up, but she particularly encouraged me when I was younger because I was quite an energetic kid but I had a heart condition. Not the best combo! Stitching gave me a place to relax but feel like I was achieving something. It’s still my happy place and it really helps me to manage my stress levels (my day job can be quite hectic). 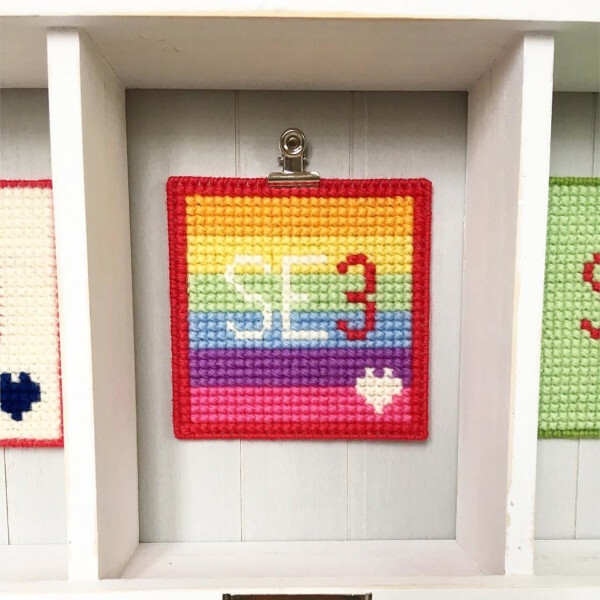 Your Postcode kits are such a cute way to introduce people into stitching and I love how they can be personalised for each person, is encouraging beginners important to you? I make a really conscious effort to make sure there is accessibility for all levels of stitcher across my designs. I love the idea of being able to inspire someone to start stitching who never has before, in fact my Postcode kits were designed with classes in mind as I thought they’d be an easy and fun first stitch kit! My advice if you’re starting out is to try and keep an even tension, don’t pull your stitches too tightly. And don’t get too worried about how the back looks, it’s the front of the piece that’s important. As someone just starting out in the needlepoint business, what challenges have you faced so far and how are you overcoming them? Self-doubt for sure has been my biggest challenge!!! But I’m trying to just enjoy the process and the excitement of making it up as I go along, finding my way of doing things. Indie Roller has been a huge help. 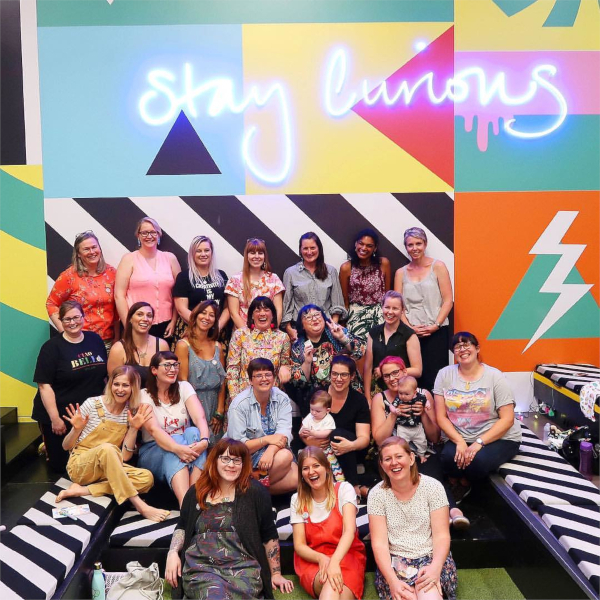 I try to go to as many of their events as I can because you get the best possible focus group to bounce around design ideas and ask questions about business bits and bobs. The resources Indie Roller founder Leona gives us are fab, but the access to the hive mind that is the membership group is worth the money alone! 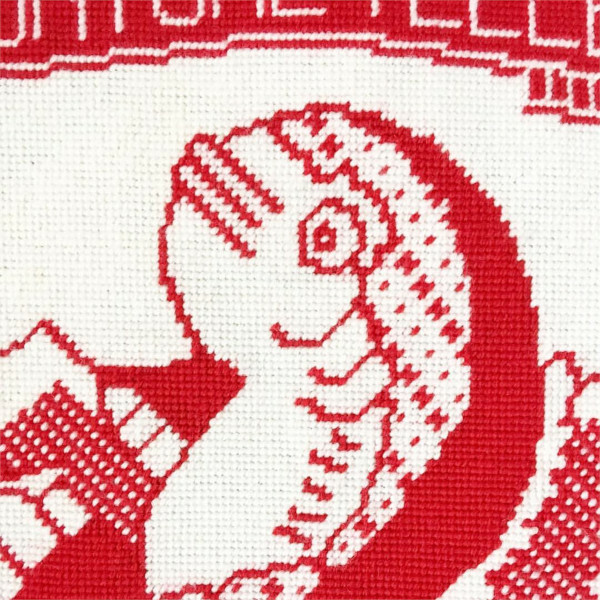 Your first pillow kit design is of a licensed artwork, the Fortune Teller Fish! Can you tell us some more about how this design came to be? I grew up loving them and how magic they seemed. I’d often thought how cool the packaging would look stitched, it’s so graphically appealing. So I spent a few months researching and reaching out to the right people who could grant me the license to use. I think I got particularly lucky as the company who have rights to manufacture it have had the license for over 50yrs and they’re still a family run business. They were amazingly helpful and really supported my idea. I’m hoping to have the kits ready for sale in the Summer and will most certainly open up for pre-orders, keep an eye on my Instagram account. 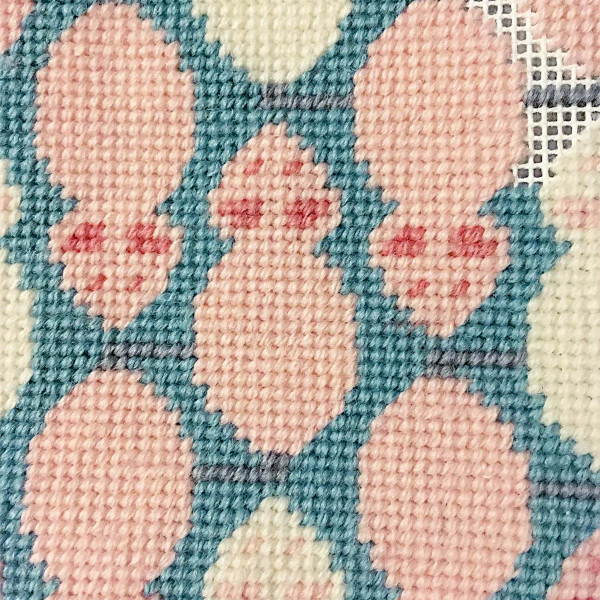 I loved the challenge that a bicolour pattern gave me, and it’s definitely something I want to explore again. Would you like to continue working with licensed artwork or was this a one off? I see collaborations being a huge part of my craft business. 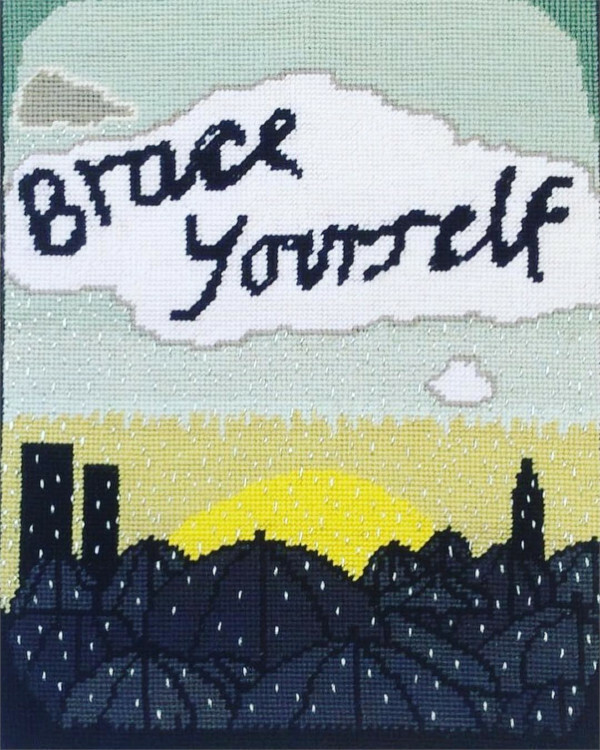 A real catalyst to starting The Makers Marks came 9yrs ago when I worked with an Illustrator friend of mine, Oli Frape, on a piece called, Brace Yourself. I love being able to translates work from the artist’s medium in to stitchy form so I am totally open to people approaching me with ideas! I have a couple of brand collaboration ideas in the pipeline similar to Fortune Teller Fish. Watch this space! Where do you sit down to sew? 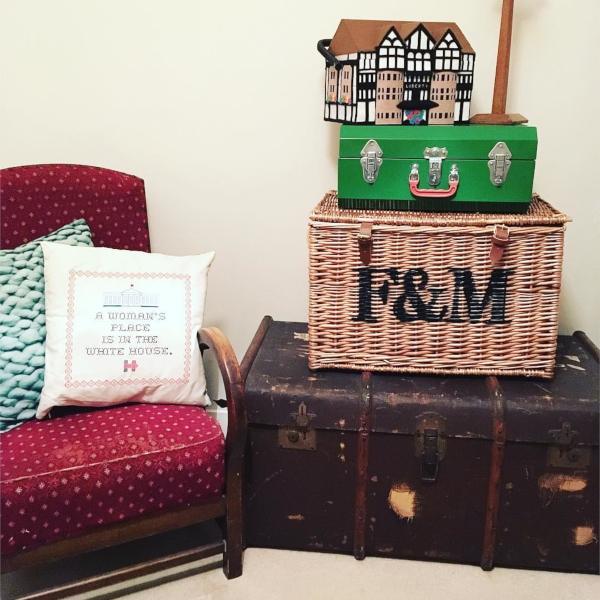 I’d love to say my craft room (and I do have one) but I’m mostly found on the corner of my sofa surrounded by canvases, boxes of wool, a sketch pad and my iPad. Which threads and fabrics do you like to sew with the most? I’m a true Anchor Wool fan. All the kits I got when I was little were Anchor wool based so I’m really nostalgic about still supporting the brand. And canvas-wise most of my work is on Zweigart 12ct Interlock, although there is a fair amount of plastic canvas I like to use for mini kits, I just love how chunky it is. On a side note my new obsession are the R&R Clip Frames, they’re a dream to use. So lightweight and don’t mark the canvas. Which indie designer/makers do you love? 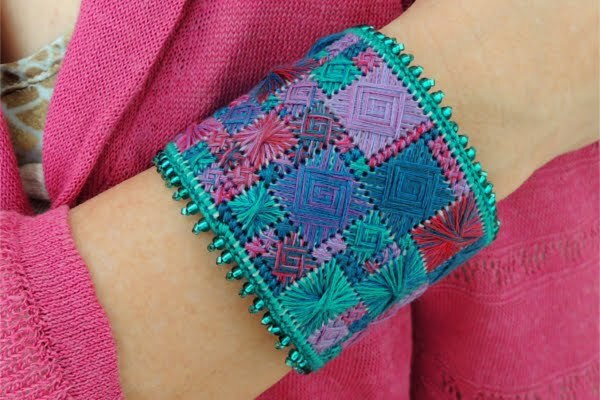 Kaffe Fassett is my craft icon! I grew up with his designs all around me that my Mum had stitched or knitted. I used to look at the pattern books and just loved all the vibrant colours and pattern work. I adore his work still and actually took my Hen Party to his exhibition at The Fashion and Textile Museum. Emily Peacock has been a huge influence too, her genius use of colour and typography particularly. When I first saw her designs they really showed something different could be done with needlepoint. They inspired me to collaborate with an illustrator friend of mine and really that was my first step into building The Makers Marks. I’m lucky to call her a friend too, the woman is a marvel and such a great support and cheerleader. Can you tell us more about the South East London Wool and Textile Society and the events you run? I heard about the group through Twitter ahead of their inaugural event last summer and approached them to see if they needed any help. 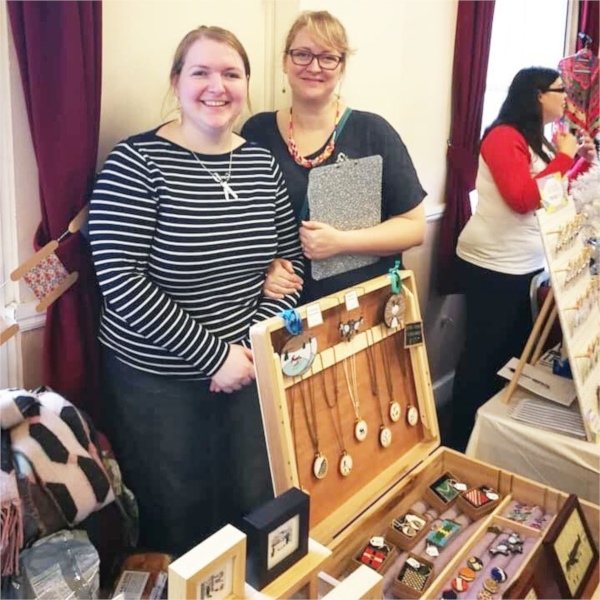 They run a biannual Wool & Textile Festival and I mainly work on the market side of things, so I’m always on the lookout for amazing makers to invite to showcase their work. The event also has a gallery space for textile art. One of this year’s featured artists is the amazing Emily Tull who you may remember from Portrait Artist of the Year. We have a number of talks and workshops planned too. Last summer we had 1000+ visitors a day and we are hoping for even more this year at the Woodlands Farm Trust on the 29th & 30th of June. If you’re in the area, we’d love to see you there! 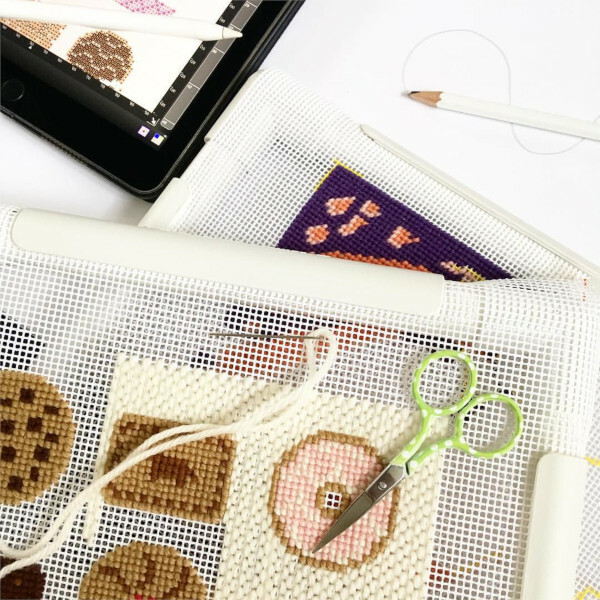 Do you listen to podcasts or watch YouTube channels or TV series while you stitch? Give me a crime drama and I am a happy girl. When I’m stitching I always have one on in the background, normally a Midsommer Murders or a bit of Agatha Christie. Which are the best needlepoint books/resources you’ve come across and why do you find them so useful? I love the Mr X Stitch website. Jamie has brought together a great selection of craft writers and seekers, so a wander through the site always brings up something inspiring. What’s the best piece of advice you’ve had so far? I have a Photography Degree and my tutor had a phrase he used to repeat at us, normally whilst poking his finger at your stomach, ‘trust the boss’. I always have that ringing in my head, if my creative gut is telling me something, I listen. Thank you so much for chatting with us today, Emma! 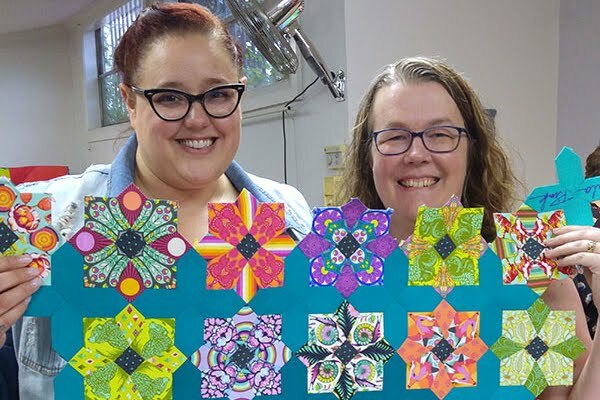 It was so much fun to learn more about you and your sewing adventures. I looking forward to seeing your works in progress come to fruition and what the future holds for you. Don't forget to follow Emma on Instagram to stay up to date and find out when her kits go on sale! Last time Anne Fisher shared her story with us, if you missed it then Let's Meet: Anne Fisher Needlepoint. Next time we'll be meeting Emily Peacock! Stay tuned. We love hearing from you, please leave your thoughts or questions for Emma in the comments. I'll be back soon...until then, have happy hand sewn time!